Platformers are back on the rise again with last year containing some triumphant returns and debuts in the genre. The trouble is that many of the newcomers struggle to live up to the classics because… well because they are classics. There are a few studios doing fantastic work in this area though, and 13AM Games is definitely one of them. They are the studio behind Runbow, the absolutely stellar multi-player platform-racer that is so good it can ruin friendships – the one true mark of a good competitive game. 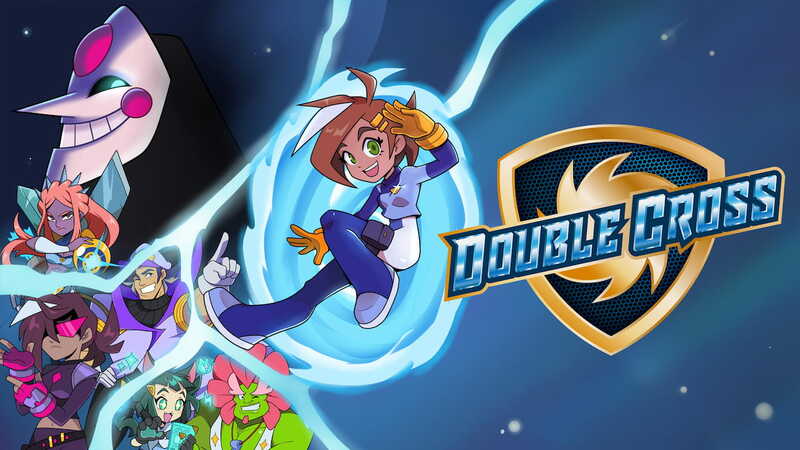 Double Cross is the latest offering from the studio and it mostly sticks to what they do best: fast-paced, chaotic platforming action. This time though the focus is on a single-player story-driven experience, one that has you play the role of Zahra, an agent of the Regulators of Interdimensional Frontiers and Technology, or R.I.F.T. The role of this organisation is to maintain peace in the multiverse. This is anything from accidentally stepping through a wormhole to dealing with full-blown crime syndicates. Exciting work no doubt. Having just come back from a fairly trivial case involving a hent – I mean tentacle monster; the base gets raided by a mysterious force. Thankfully you aren’t an agent of R.I.F.T. for nothing, you’re actually quite the detective too. As you journey through your home turf you find a few clues, after presenting them to the right people you have an idea of where to go to progress the case. So begins your adventure around the multiverse to try and figure out what on earth’s going on. To get around these strange alien worlds you have the basic things like running, jumping, and punching. You also have a Proton Slinger; a futuristic grappling hook which slows down time every time you prepare to use it. This actually makes for some of the most interesting platforming sections in recent memory, the ability to grapple is nothing new. The ability to slow down time, on the other hand, allows for some really nasty platforming sections, but they become manageable because you can breathe a bit as you do them. This again isn’t a brand-new concept, but it is implemented so well it is hard not to feel like it is revolutionary. The levels themselves are set on different worlds with different themes. Each of them is a self-contained little story arc that feeds into the greater case that you’re trying to crack. One of the early ones has you tracking down Agent Pineapple; who is literally a pineapple. Apparently, this agent is a master of going undercover and an expert in the art of disguise. This gives you a good idea for just how silly the writing is. Nearly every character is a play on words, nearly every moment has some kind of pun or dad joke tucked away. It is genuinely funny as a result, it’s nice to play something that is both light-hearted and also fairly challenging. The art style is brilliant. It has a really crisp and colourful look that makes every character pop and every level interesting to explore. The hidden areas in each area are hard to find, but also well telegraphed as long as you are paying attention. Enemies are easy to spot, attacks are easy to read, all thanks to the fantastic animation and anime style. The whole experience is just a lot of fun to play. While the game is completely new it somehow has some of the spirit of many of the classic platformers. The combat is surprisingly deep, the platforming is equal parts satisfying and immensely punishing, it is all brilliantly balanced. The story and characters are all charming enough to keep you playing, overall the whole game is just wonderful. It is easily the best platformer I’ve played this year. Of course, it’s the only platformer I’ve played this year, but I honestly believe it will still be one of the best platformers come year end. This is definitely worth checking out if you fancy an old-school feeling platformer that is full of modern charm and gameplay.